How do people come to do good, or to fail in so do doing? This is a fundamental question of moral psychology, that is, the study of moral agency and moral character in humans. It is this question that Nomy Arpaly and Timothy Schroeder, professors of philosophy at Brown and Rice, respectively, tackle in their monograph. The goal of the volume is to contest the received wisdom that morality hinges on reason, and is thwarted by 'succumbing' to desires. On the contrary, Arpaly and Schroeder argue, desires are necessary for morality. To be moral is to act on what one intrinsically desires, provided that one intrinsically desires the right thing. The first half of the volume holds off discussing morality in order to explain what reason and desire are and how they work. Reason is analysed as (the capacity for) deliberation; out of desires, it is intrinsic desires that Arpaly & Schroeder are interested in, that is, things that one desires for themselves, not instrumentally. Such intrinsic desires range from desiring the well-being of a loved one to desiring that one's favourite football team wins. With these specifics at hand, Arpaly & Schroeder launch to solve their first problem: what makes it possible for us to act for the right reasons? Deliberation, that is, the conscious weighing of various reasons, has often been seen to play this role. In order to know if our reasons for acting are good ones, we need to take a step back and weigh our options. Arpaly & Schroeder argue, however, that deliberation cannot play this role because it is itself an action, something we can choose to do. The abilities that found agency need to be nondeliberative and nonvoluntary. Deliberation remains valuable, but not foundational. As Arpaly & Schroeder succinctly put it, "Reason plays a limited, contingent, and modest role in human life." What, then, is this underlying nondeliberative process, the foundation of agency and morality? In Arpaly and Schroeder's theory, this role is played by the reward system of the brain. Intrinsic desires, then, are states of the reward system. Arpaly & Schroeder's approach reads as highly reductive, which the authors are prepared for, acknowledging that "Unconsciously responding to P as a reward […] does not sound very much like intrinsically desiring that P". But for Arpaly and Schroeder, this is simply how the world is: sometimes we discover surprising facts about familiar things. With effortless, fluid prose, Arpaly & Schroeder tackle showing that the reward system plays the role we assign to intrinsic desires. They argue that the reward and punishment systems play all the roles we associate with intrinsic desires. It is necessary for action production, it is connected with feelings of pleasure and displeasure, and it is involved in cognitive processes such as the direction of attention and reward learning. The evidence is robust but not conclusive. What I find especially troubling for the moral psychologist is the case of reward learning: while it matches the commonplace observation that we can learn to desire new things in the face of environmental cues (what are referred to as 'adaptive preferences'), it raises concerns about the role of authenticity in moral agency. Authentic and non-authentic desires cannot be differentiated in terms of the reward system, yet it seems that when we talk about the role of desires in agency, such a differentiation ought to be fundamental. One way out of this puzzle would be to bite the bullet, saying that the reward theory shows such a differentiation to be superfluous or at least contingent on further facts that do not directly concern the nature of desires. While Arpaly and Schroeder's account of desires is neuroreductionist, they go on to show that it is compatible with a robust theory of virtue. 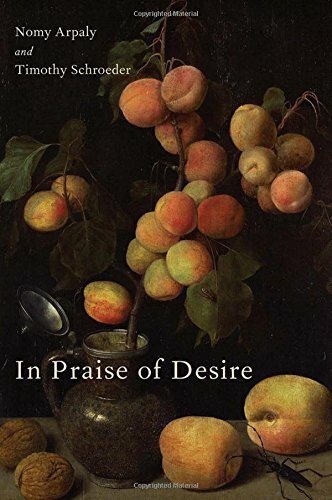 The second half of In Praise of Desire is devoted to discussing what makes actions moral, and how such topics of ethical inquiry as virtue and moral blameworthiness track intrinsic desires, that is, track the functioning of the reward system. For Arpaly and Schroeder, a person has complete good will if she has "an intrinsic desire for the right or good, correctly conceptualized". Partial good will is desiring some part of that correctly conceptualized right or good. (The authors avoid commitment to any specific moral theory, holding that their account of moral psychology is compatible with any theory of what constitutes the right and the good). The strength of the intrinsic desire determines how much good will a person has. To be virtuous is simply to have good will, that is, in effect, to have the right kinds of states of the reward system. Moral praiseworthiness or blameworthiness tracks the presence of good or ill will: actions with moral relevance are praise- or blameworthy insofar as they are manifestations of good or ill will (or of moral indifference). Arpaly and Schroeder march in a veritable army of examples and thought experiments to demonstrate how this conceptualization of moral responsibility works out in practice. An interesting feature of their theory is that the strength of desire for a motivating reason doesn't always track how much one values that reason. This, for Arpaly and Schroeder, is the case in addiction, where they hold that the reason why an addict might consume an addictive substance despite valuing it less than they value sobriety is that the substance causes them to have a disproportionate reward response towards the substance. The case of addiction is clearly one that any theory of moral agency needs to be able to explain, yet I wonder if Arpaly & Schroeder's theory is compatible with recent research into the environment-dependent, rather than neurobiological, nature of addiction. If the role played by the reward system in addiction turned out to be trumped by the role of the social and material environment, would Arpaly & Schroeder need to adjust their theory of moral agency? These questions notwithstanding, the readability of Arpaly & Schroeder's prose and the ambition and encompassing nature of their argument makes this a necessary read for moral psychologists and a great choice for the general reader interested in recent developments in moral psychology. It would also make a great addition to a graduate or undergraduate syllabus. Contemporary debates on ethics must respond to the challenge posed by the growing mass of research into human agency and morality within the cognitive sciences, often thought to undermine theories of virtue and of responsibility. The great accomplishment of In Praise of Desire is that it shows that a robust theory of virtue and moral responsibility can be founded on a behavioral and neural basis. As such, it is an excellent contribution to moral psychology. Polaris Koi, MSocSc, a doctoral candidate in Philosophy at the University of Turku, Finland.